This was an exciting project! The White Dog Cafe is a well-known restaurant in Philadelphia, and they opened another location in the main line outskirts of the city. The builder was David Semerjian, and he used our tiles in the entry, the bathrooms and the large garden dining room. The style selected for the floors was the Rutherford brick tile, combined with some tiny paw prints. Brick tile restaurant floors are a good application for our brick veneers, because they hold up to the constant foot traffic of a successful restaurant. 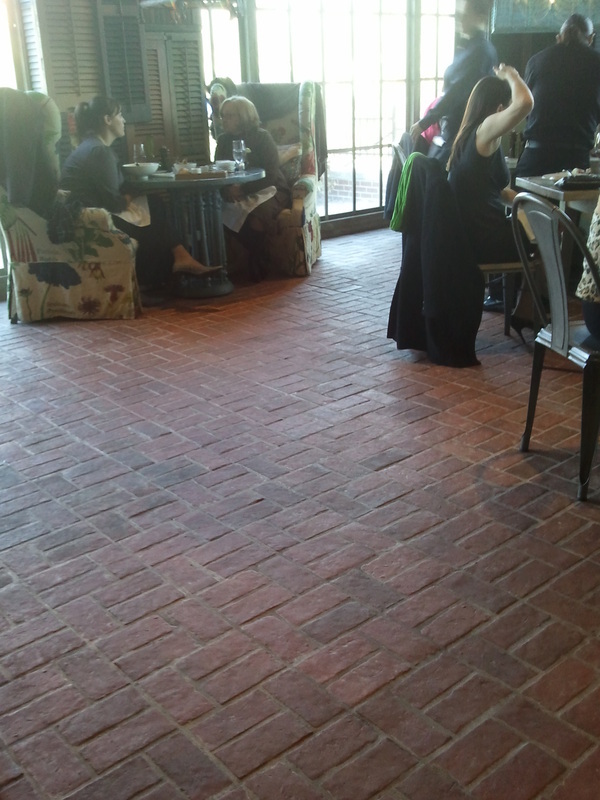 This is the Rutherford style of our brick tiles on the floor of the garden dining room. The installation pattern is what we call the "broken basket weave." It is a little different than the classic basket weave of two over two tiles. The slide show is some of the "before" pictures of the Wayne, PA White Dog Cafe. Now it is a bustling place!